Prior to your initial service, you will be required to complete the client intake form. Completion of the form is necessary to protect you from any risk of injury that may result from treatment. We may also ask your permission to contact your primary care physician (PCP) in order to gather a more detailed medical history. Tocar Spa maintains strict confidentiality of all client records. These preventative measures are put in place to safeguard your health and well-being. 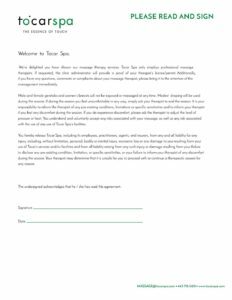 We recommend that you download the completed form to your computer and then attach into an e-mail addressed to massage@tocarspa.com. Thank you.